Today we are going to talk about "Forgiveness." Our example and goal of forgiveness is the type of total forgiveness that we receive from our Heavenly Father through the blood of Jesus Christ. God sent His one and only Son to died on the cross so that we all might have everlasting life. This post is in a "Q & A" (Question and Answer) format. Q: How can my sins be forgiven? A: The first step is to believe that Jesus died on the cross for your sins - it's just that easy. Pray to God thanking Him for the gift of salvation through His Son Jesus Christ. 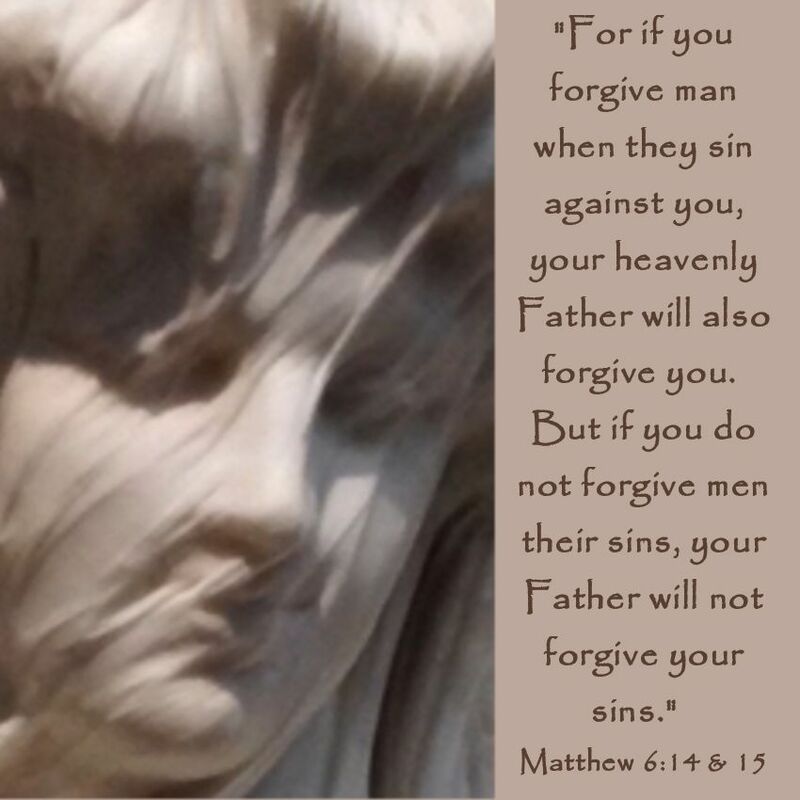 The next step is to follow God's example of forgiveness and forgive everyone around you - forgive whatever wrong that has been done against you and then you will also be forgiven in that same way. "Treat others as you would want to be treated" and "Forgive others as you would want to be forgiven." Q: Are there some sins that can never be forgiven? A: There's nothing more simple than "all". That means every huge and horrid sin and every tiny seemingly insignificant sin.....ALL....."The whole lot"........"The whole kit and caboodle"........"The whole shebang"...........Every single little, moderate, big and everything in between sin......Everything is forgiven through Jesus' sacrifice. Q: Are there certain people who are exempt from receiving forgiveness? A: Again, another simple answer - Everyone. That includes people of every kind of race, every religion, people from any country; it includes family, friends, neighbors, strangers & enemies; that also includes the young, old and everything in between and men and women alike - EVERYONE! Q: What if someone doesn't know that they are sinning? - Do we still have to forgive if they haven't repented? "When they came to the place called The Skull, there they crucified him, along with the criminals - one on his right, the other on his left. Jesus said, 'Father, forgive them, for they do not know what they are doing.' And they divided up his clothes by casting lots." A: This is one of the most difficult things to do - forgive someone even if they don't know that they are sinning. Tears come to my eyes every time I think about this verse & what Jesus endured for our sins - for our salvation. Not only did Jesus forgive the 2 criminals that were being crucified with Him but He also forgave the people who were nailing Him to the cross & He also forgave the people who were gambling His clothes away!!! He cried out "Father forgive them for they do not know what they are doing." So, the answer is YES - we need to forgive everyone and every sin even when that person doesn't realize that they are sinning. Q: OK - so we have to forgive but do we have to forget also? A: I'll answer this question with a question - Is it really forgiving if you are not forgetting? Now, I know that we are human and of course we will remember what was done to us in the past - but if we do not forget that means that we are constantly bringing up that sin in present and future arguments or conflicts. When you have been hurt by someone it is so easy to bring up all of the other "hurts" from the past - but that's NOT forgiveness - that's holding onto that offense. We MUST forget because that is part of forgiveness. Q: How many times do we have to forgive someone? A: The "RSV (Revised Standard Version)" of the Bible actually uses "seventy times seven" - either way I believe that Jesus is stating that forgiveness is unlimited. Can you imagine how crazy it would have been if Jesus was being literal? - We would then have had to keep a "forgiveness log" on everyone keeping track of how many times that each person had been forgiven - craziness! The truth is that God's forgiveness is unlimited and so should our forgiveness be unlimited.